the Role of Rotary in Peacemaking including his own personal involvement in humanitarian projects around the world. Renuka Sethi, Chair of the Peace Committee announced the following individuals or organizations nominated for the 2018 Peacemaker Award. 1. Knox Williams was nominated by Renuka Sethi. 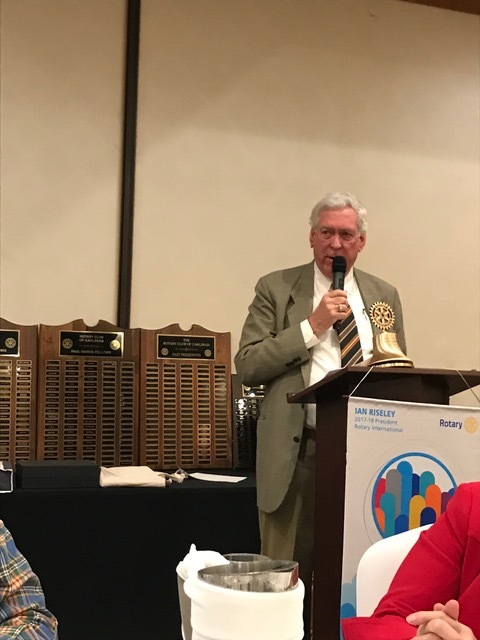 A humanitarian and a Rotarian for 39years, Knox has been very active in the Carlsbad/North County community for several decades. joined in 2008, after establishing a fund to provide scholarships for disabled MiraCosta students. Knox’s major passion over the past 11 years has been the Carlsbad Charitable Foundation. offered quietly, without fanfare, to nonprofits such as Kids for Peace, which began locally and has become a global presence. More recently he has become involved with Hands of Peace. Israelis and Americans. They are empowered to raise their voices as leaders of change. Through the power of dialog, they partner to pursue peace, equality, freedom and justice. water conservation, recycling, composting, respecting nature and doing their part as ambassadors for the environment. 4. Julie Nygaard was nominated by Renuka Sethi. Julie has been active in the Carlsbad/North County area for several years and has spent most of her adult life volunteering. with her service for 10 years on the North County Transit District, with 3 terms as chair. In 2012, she was elected to TriCity Hospital Board of Trustees. The Peacemaker Award Selection Committee included Renuka Sethi (Chair), Joe Bear, Kevin Clark, Jeff Schafer and Frank Silva. Knox Willams made a few remarks after accepting the award: He spoke of Kids for Peace, an organization that creates peace through youth leadership, community service, global friendships, and thoughtful acts of kindness. He quoted Gandhi, World Peace starts with Children. Kids for Peace, an organization founded by Jill McManigal was the winner of the first award in 2015. The award ceremony concluded with Renuka Sethi presenting the perpetual plaque listing the winners of the Rotary Club of Carlsbad Peacemaker Awards to Club President Kevin Clark.